Thawing and sauteing is all you have to do have a delicious, ginger sauce marinated pork loin dish on the table. Product totals 195g (about 4 to 7 pieces). Sugarlady uses tender pork loin from Canada that is free from therapeutic chemicals and antibiotics. There has been much discussion about eating pork and diet that includes pork meat, however, pork is unquestionably rich in protein, minerals, vitamin B1, B2, B6 and B12, especially the amount of B1 that pork contains is said to be 10 times more than that of beef or chicken. B1 helps the enzyme’s function of converting carbohydrates into energy. Therefore, when our bodies are low in vitamin B1, we are more prone to fatigue and weight gain. The loin is a part of pork that has a large amount of protein and fat. Although it’s not the leanest part of pork, it has a good balance of flavor and nutritional value. Ginger is one of the important seasonings in East Asian cuisine. It has an unmistaken flavor and it’s nutritional and medicinal benefits are countless. It enhances immunity and blood flow, fights against aging and inflammation, and is great for weight loss. Thaw by putting the package in the refrigerator. When done thawing, pour the sauce and cover the meat completely to marinate the meat. 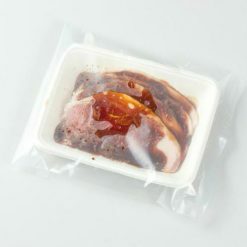 If desired, keep the meat marinated in the fridge. Pour a small amount of oil in the heated frying pan, and add the meat with the sauce. Cook both sides over medium heat and serve. This goes very well with a bowl of steamed rice. 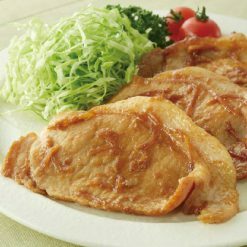 This product contains pork loin (Canad), sauce (soy sauce, ginger, sugar, syrup, rice vinegar, cornstarch, sesame oil, yeast extract, onion powder / caramel color, thickener (xanthan gum).